Have orange tulips delivered to each and every one of our thousands of treasured members. Gather the whole team here to call each of our members and sing a little Valentine's ditty we came up with that goes to the tune of "Ice, Ice, Baby". Go to the animal shelter and adopt a pet for every 100 of our members and send you all monthly emails from your "remote pets". What we eventually decided was to show our love and gratitude for your support by focusing on helping make your life easier and finding even more ways to make you more successful. Not nearly as exciting as getting a singing message from us. But still pretty good, right? Along with that, we also released a few more goodies you guys have been asking us for. Enjoy, and I hope you have a wonderful Valentine's Day filled with love and happiness! We've been trying for a couple of years to find a shade of gray for the schedule to represent unavailable times that everyone would be happy with. We like the lighter look ourselves as it preserves the open and clean design of the MassageBook schedule, but we realize that not everybody's computer screen shows colors the same way or has the same resolution. We gave up trying to find a shade that everyone would be happy with and now proudly offer you the ability to pick your own shade. We hope that this finally lets everyone find a shade that shows up well on their screens! 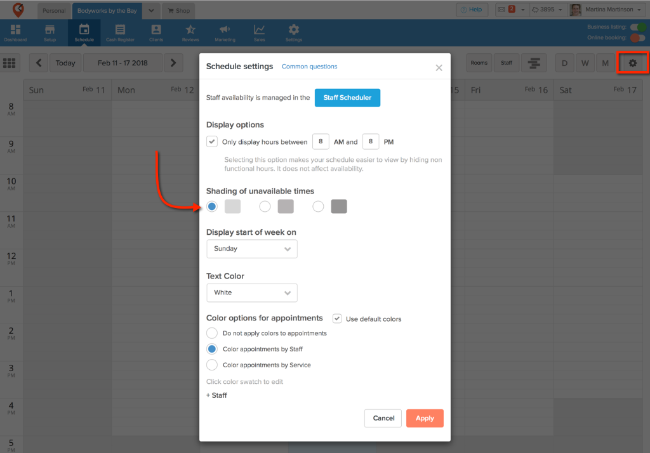 To access this new Schedule Setting, simply click the gear icon in the upper right corner of the schedule to open a window showing all the scheduling display options. Log in and give it a try! 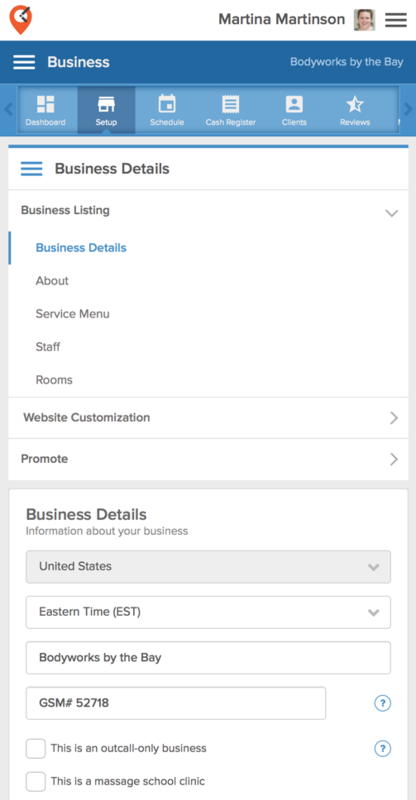 This release we share with you the mobile-friendly version of the business setup section. We're working diligently on making the better part of the desktop version of Massagebook mobile compatible, so you can easily do what you need to in the main software from your phone. For now, we think you'll find the experience of reviewing and modifying business details, services, and more in the desktop version to be quite friendly to those of you who'd like to change any business details or settings from your mobile phones. And if you haven't downloaded our native mobile apps from the Apple or Android stores yet, be sure to check that out as well. You'll find the mobile apps under the name "MassageBook Pro". 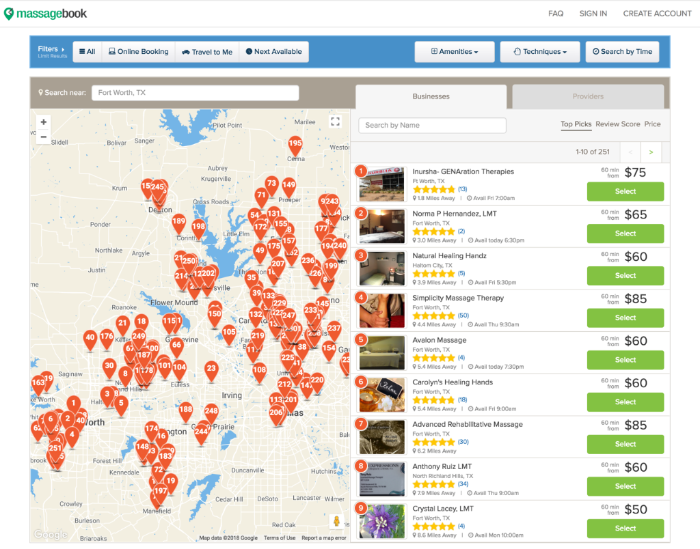 Over 250,000 massages a month are being booked using MassageBook! With that number growing rapidly, searches in some of the larger metropolitan cities were getting slow. Not acceptable when our mission is to get more of the public to schedule massage and bodywork with independent practitioners. So we took a look under the hood of our search site code to see what's what. The short of it is that our brainier than brainy engineers discovered a way to dramatically increase the speed of loading and displaying search results. We fully expect the speed boost to help get even more people successfully searching and booking therapists and bodyworkers on MassageBook. Sending more business your way makes us very, very happy!